I was quite interested to see the new “Hotel Mumbai” movie and to see how the filmmakers would present the elaborate terror attacks in 12 Mumbai, India locations committed by Jihadist Pakistani Islamic terrorists almost 11 years ago. As it turned out, the movie did not spend too much time on the actual number of attack locations, but quickly centered on the attack and occupation of The Taj Palace and Tower, which lasted from 26-29 November, 2008, and on the efforts made by the staff and guests to survive. The Mumbai attacks, which the locals refer to as “26/11”, brought expanded new terror tactics to a densely populated city of around 15 million people. The well-trained suicide squad of 10 men committed 12 public attacks across the city, and then took control and held two large hotels for several days instead of running away. Hotel staff and guests were held hostage or were hiding in the buildings for up to four days. 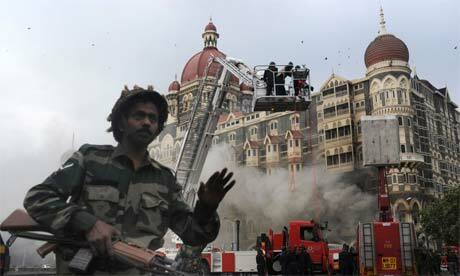 174 people were killed and 300 wounded in the Mumbai attacks. Many of the deceased found in the hotels showed signs of torture and mutilation. Nine of the ten attackers were killed by Indian Counter-Terror troops. Number ten was publicly tried and then hung quite effectively. This elaborate series of attacks set counter terrorism planning and training around the world on its ear. Planners had to expand scenario horizons in the aftermath to include the possibility of multiple actor, multiple event terror attacks which extend for days, instead of a traditional one location event. Up until the mid-2000’s most of what we know of as international event terror attacks involved bombs and explosives or suicidal Jihadists wearing bomb vests. Mumbai suffered “traditional” bomb attacks in 1993 (257 killed/700 injured), several in 2003 (59 dead/377 wounded) and in 2006 (209 killed/700 wounded), so they were not new to mass casualties, but the 26/11 attacks strained every emergency service and the hotels could not be freed for days. The 10 attackers came with considerable Pakistan based commando training and support, full auto AK-47’s, Chinese grenades and RDX improvised devices…and a fervor to kill the maximum number of innocent people based upon their Jihadist beliefs. Imagine 12 such attacks in Chicago or Los Angeles over a four-day period tying up police and fire resources and filling every hospital bed. In India, they brought in the military anti-terror forces to end the massacres, in the U.S. the Posse Comitatus Act would preclude the use of military forces and responses would fall to the FBI, some other federal agencies, state and local police departments. The Taj Palace evacuated 200 guests the first night, but it was not raided until the fourth day, 29 November, 2008 by India National Security Guards in “Operation Black Tornado” after the terrorists set multiple fires in the hotel. During the action, government troops they killed the last three terrorists and freed an additional 300 hostages. Imagine only 3 armed bad guys holding a 560-room hotel for three and a half days and having to clear every room and service area as well as conduct crime scene work! The movie for me was a two-hour exposition of “What would you do?” This was the worst active shooter event in the world to be trapped in. Three shooters held The Taj for days and killed anyone they ran across. 37 people were killed but 500 people managed to survive. The now familiar “Run, Hide, Fight” active shooter training concepts were evident throughout the film, and I challenged every scene in my head trying to wrangle ways to increase the odds of survival against what was shown on screen. It is just a movie after all, and can never be entirely accurate, but it was quite well done and the chaos of the event was quite palpable. I have worked terrorism cases and post attack scenes, trained civilian and military audiences on how to survive active shooter attacks, and am always looking for any information that might extend my time here on earth. Viewing this film as a training film in addition to big screen entertainment was well worth the time I invested and I recommend it to you.. The movie showed a seemingly inexhaustible supply of bad guy ammo, very good comms and telephone service, and lots or terrible tricks. Devious methods included forcing hotel staff to call individual rooms and telling them rescue forces were in the hall and to unlock the doors and come out-to fatal results. They also showed a bad guy using a dead policeman’s ID, and the capture and use of an actual police car. Run- hundreds of people ran out of the building during the initial attack. Many scenes showed people falling and being trampled-yes it can happen like that. 7.62x39mm rds are quite a motivator. If you have to escape an active shooter, run fast and run far. Run to cover, and run rifle accuracy distance away if you don’t have cover. There is nothing to prevent shooters poking guns out the windows and continuing to shoot at gawkers. 300 meters is well within effective AK range. Gunfire will cause many reactions, and confusion is generally the first and can lead to panic and inability to actively save yourself. If there are gunshots near you, don’t stop to think – “What was that?” and “Was that gunshots?” -if you hear shots, or see someone shooting or with a gun go now! Pausing to try and understand what is going on is contraindicated and may lead to cancellation of your subsequent birthdays. Hide- the movie shows a lot of the guests and staff hiding in singles and groups across the hotel with varying degrees of success. You have to go dark, quiet, and as secure as you can. One of the movie items I frequently found some fault with, was failure to secure and barricade doors. Showing a victim stringing the chain latch on her door was poignant – it was all she had in addition to the door’s actual lock, yet she was in a hotel room chock full of furniture. A large group hid in a club with no windows and limited access, and you get to see some “barricade” material that your average 8 yr old could not only move, but disassemble or break in about 4 to 5 seconds. I am sure the real victims did better. Improvised door wedges can be made to stuff under doors and even to jam door frames to help prevent them being opened. Belts, curtain cords, extension cords can also be used to tie on to the door latches and tensioned/tied to other objects. Any is better than none. One of the attack plans included two terrorists to drop in and shoot up a large hospital in Mumbai. When they got there, the hospital had locked it’s doors and refused to let them in…a simple locking of the doors hardened the target enough to defeat these guys. They moved on to an easier target. With AK’s, grenades and RDX they could have quite likely breached doors or windows, but as with most active shooters, they are too busy inflicting maximum damage on soft targets to slow down and struggle against more difficult targets. Lock the doors and shut off the lights if you are trapped within an active shooter scenario! Two policemen are shown as potential rescuers in the early takeover. I was rooting for them, but it was awful to hear one ask the other “How many bullets do you have?”, the answer was “Six” and the original policeman said “Me too.” It had the ring of such truth to it. You are at a severe disadvantage fighting terrorists with simple pistols. Failure to carry reloads is even worse. If you have a gun, have at least one reload with you. Period. End of Message. Keeping with the “Fight” category, if you could capture an AK style rifle, do you know how to operate one? Clint Smith originally said to use a pistol to fight your way to a rifle. If you can’t run the gun of your chosen enemy, it is useless to you and makes a poor club. The movie of course depicts the Jihadists with their folding stock AK’s….with their stocks folded during the whole movie. We have seen this “assault” technique in real life, as well as on the news, and in the movies…but geez, you would think at least one of them would be smart enough to open the stock to increase accuracy! Can you work a folding stock on an AK? Movie grenades, of course are super powerful bombs strong enough to collapse whole buildings. They are also thrown on the ground for several seconds so the victims (and camera) get a chance to see them and recoil in terror. Grenades are much more shrapnel lethal than concussion lethal, and burst radius be damned, get down on the ground in a grenade attack. Most of the explosion and shrapnel goes up and out. In one movie scene, the bad guys lay one at the base of a door that won’t open-most likely shrapnel would rip on the door, but the high explosive force would not be directed into the lock area or be strong enough to blow it off it’s hinges without additional attachment or support against the door to direct the charge. This was a movie showing the story of both terror and impressive bravery by hotel staff and guests. There are some fine performances, and well worth watching for the historic impact as well as to apply your brain and imagination to try and add additional files into your mental filing cabinet of the “What would I do” files. This entry was posted on April 11, 2019 at 9:00 pm and is filed under Blog. You can follow any responses to this entry through the RSS 2.0 feed. 4 Responses to “Hotel Mumbai Movie”- Lessons from 4 days of Hostage Terror. Everyone wants to think it can’t happen to them. I will start carrying reloads. I can’t wait to stream it.